The UK government is to give extra funding for gay rights campaigners in Russia amid growing concerns over the introduction of legislation outlawing the promotion of homosexuality. In an interview for the BBC, Culture Secretary Maria Miller said it was the "right thing to do". Additional money will be given to protest groups such as Stonewall. The move comes just a week before the start of the Winter Olympics in the Russian City of Sochi. The sporting showpiece has already been dogged by concerns over freedom of speech and security. "It's very important indeed we use the opportunity of the Winter Games to underline the importance of treating people fairly, which is at the heart of the Olympic charter and important to the Olympic movement," said Mrs Miller. "As a result of the changes in the laws in Russia, there are considerable strains on gay rights. "We are already putting in place additional support to make sure that gay rights organisations have got the sort of support and expertise that I think can make a real difference with the work they are doing on the ground in Russia." Because of restrictions imposed by Russian law, foreign governments cannot directly fund action groups and protesters on the ground in Russia. Instead they must channel support through international non-governmental organisations known as NGOs. Mrs Miller added: "The most effective way we can support human rights groups, particularly gay rights groups, is by working with organisations like Stonewall, to support them through funding so they can provide effective support and capacity building on the ground, so NGOs in Russia can be even more effective in the future." Miller, who will be the UK government's most senior representative in Sochi, said she was anxious that the row over gay rights did not overshadow the Games or the preparations of the British Olympic and Paralympic teams. She also dismissed concerns her announcement of extra support might be seen as provocative by the government of Russian president Vladimir Putin. "I think it's important that we state very clearly as a country we believe in freedom of speech and we believe in universal human rights," said Mrs Miller. "These are issue we don't shy away from. I think this is a great opportunity. This sort of support will be very welcome from Britain." Activists in Russia such as Nikolai Bayev have welcomed the UK's move. "The more countries like the United Kingdom provide us with such support, the better our fight against homophobia will be here in Russia," he said. Mrs Miller said she hoped the International Olympic Committee would take a "common sense" approach to any athletes who used the spotlight of the Sochi Games to raise the issue of gay rights. Earlier this week, IOC president Thomas Bach said there would be freedom for competitors to make political points in press conferences, although athletes who protest on the podium or in official Olympic venues might be punished. 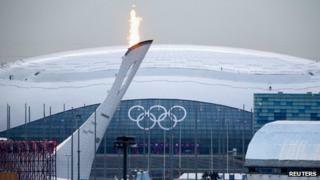 The Russian government has already said it will set up a protest zone, albeit nearly 10 miles away from the main cluster of Olympic venues in Sochi, where people will be free to demonstrate. Russia says the move is a sign that the country is committed to greater openness and is listening to the international outcry over human rights. For her part, the culture secretary believes British athletes should be free to say what they like as long as they do not draw attention away from the sport. "I absolutely believe in freedom of speech and ability of anybody to campaign on the issues which are important to them," she said. "What I would want to make sure, in the context of the Winter Games, is that they don't overshadow the event. "But these are things for the athletes themselves and the British Olympic Association. I'm sure they will look at the best way they can handle this."